Enjoy the top attractions in Segovia on this 7 hours tour of the city by luxury private chauffeur drive. 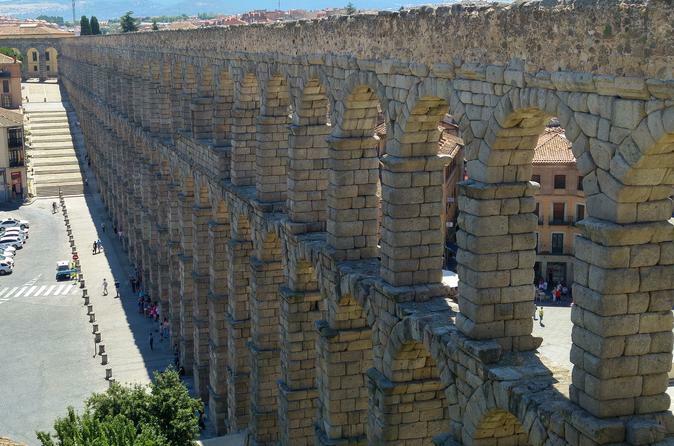 In 1985 the old city of Segovia and its Aqueduct were declared World Heritage Sites by UNESCO. Visit the Segovia Cathedral, the last Gothic cathedral built in Spain. The Aqueduct of Segovia, is the defining historical feature of the city, dating from the early 2nd century and the magnificent Alcazar of Segovia, the royal palace built on a stone peninsula between the rivers Eresma and Clamores, is documented for the first time in 1122, although it may have existed earlier, it was one of the favored residences of the kings of Castile. If you visit Segovia you must try the tradicitonal roasted baby pig, or the sweet cake Ponche segoviano. Pick up and drop off at customer convenience (hotel or agreed location) in the city. Tour is done in a luxury chauffeur drive (Mercedes Benz V-Class / Viano). Languages available: English, French, German, Spanish. Tour takes 7 hours depending on traffic conditions. Bottled mineral water available in all the tour. The chauffeur will stop the car for photo shooting if the traffic conditions allows. All entrance fees are not included. Main attractions you can choose to visit: Aqueduct of Segovia, Alcazar of Segovia, Segovia Cathedral, church of la Vera Cruz, if time available, the summer palace of San Ildefonso can be visited (nearby town of Segovia).